The Home was built in the 1895's as a old Florida grove house. It is two stories with a one story addition, added in the 1930's. The home belonged to the Alford family, who lived in it until 1972 when Mrs Alford was killed out front by a hit and run driver walking home from the cemetery after visiting her husbands grave. The son leased it to another family, to take care of the orange groves, who lived there until 2004 when the husband died and the wife moved closer to town and loved ones. Another family moved in and stayed until October 2005. It has since been vacant, for over year and still is to this day. July 2006.. our first investigation of the home. Investigators present-Sherri, Shereen, Marcy, Tracy, Bobbi and Shawn. Our initial walk through of this home revealed an average temperature of 78 degrees and an average EMF reading of .7mG. 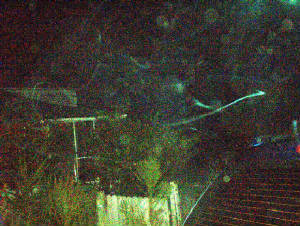 As this home has been vacant for some time, there was no electricity to give us any unsual EMF readings. A search of the barn and other outbuildings did not yield anything unusual. 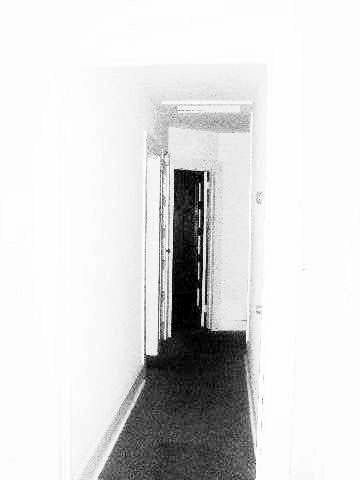 During our investigation, the team downstairs heard a door open and footsteps walking down the hall. When the team went to investigate there was no one there.  Evaluation of the evidence at the close of the investigation revealed several pictures with orbs and mist along with one EVP hat was recorded in the red master bedroom. Investigators present-Sherri, Shereen, Marcy, Tracy, Jen Bobbi and Shawn. During this investigation, again, we had several notable incidents occur. The first was a high EMF reading that was found to run down the middle of the house. As there was no power in this home, that could not account for this reading. We went up to the second story and got the same readings down the middle of the home. As noted, this was an old home, built prior to electrical wires being buried, and there were no wires that ran over the home as it was out in the middle of forty acres. We could not find any cause for these readings. Secondly, while in the front room one of our investigators (Jen) felt like something touched her face. 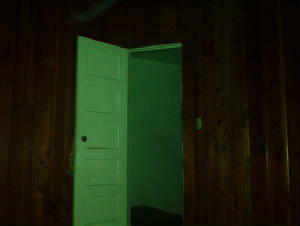 This was at the same time that we later found the EVP on the audio recording. August 2006...We did another training investigation and brought in Daytona Beach Paranormal Research Group. following week and we captured a picture of an apparition of a man standing in the upstairs bedroom door, some evp's and also a vortex, which is thought by many to be an opening from the spirit world into ours. There was so much evidence at this home it is hard to add it all to our site. We want to thank Mr Alford for allowing us to investigate his home. have now moved in and are destroying the house. 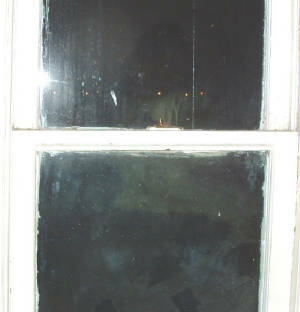 Please enjoy the photos and listen to the EVP's on our EVP page. These two pictures Above were taken on our second visit to the house. They are posted in the order they were taken. This is a seond story window that overlooks the roof for the kitchen and dining room which was a later addition to the home. 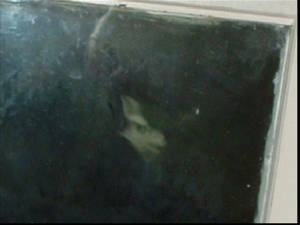 You can see the missing roof tiles through the window, the apparition(since we don't know what this is in the picture, we are going to call it an appartition) in the glass does not obscure your view of the roof. We would love to here what you think this might be. Send us an Email.